Del Mar Beach Front homes for sale in the coastal community of Del Mar. One of the most popular spots to find beach front homes is on the north side of town near the street called "Ocean Front" The homes located here sit directly on the beach front and have direct white water and ocean views. These are typically some of the most expensive homes in Del Mar and can command prices well above twenty million dollars. Another community located at the very north end of town is called Sandy Lane. 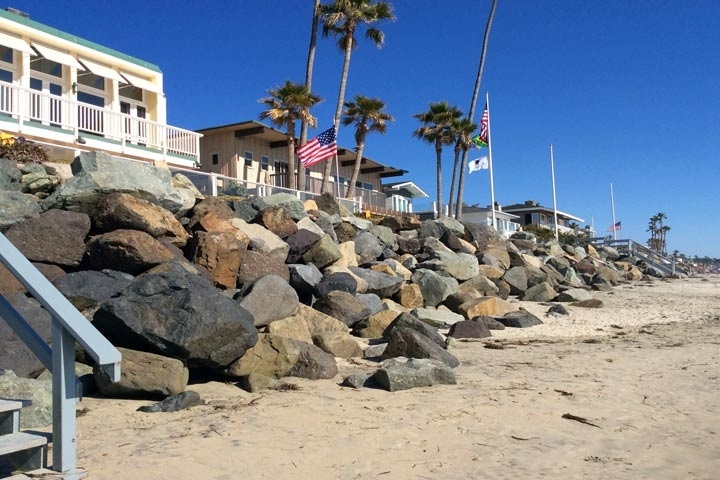 This neighborhood is very small and has a small collection of beach front homes that are elevated on rocks and have direct beach front access as pictured above. Ocean Front homes rarely come on the market here and command a huge premium due to it's prime location near the San Dieguito River that flows into the Pacific Ocean creating a surrounding body of water. Below are all the Beach Front homes for sale in Del Mar. Questions regarding any of the homes listed here? Please contact us at 888-990-7111 today!